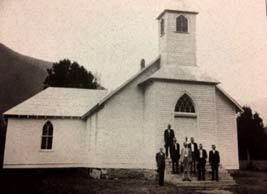 a small congregation of faithful Christians built the first sanctuary and public school in Maggie Valley. Today, our vital congregation continues its original priorities with all the people in the valley: worship and service. The Methodists built their first log building along the banks of Jonathan Creek. 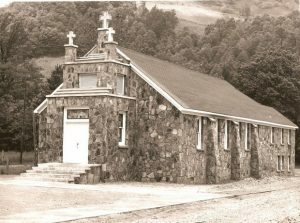 Still at this same location, now below Cataloochee Ranch and Ghost Town and across from Joey’s Pancake House, Maggie Valley UMC celebrated this great anniversary in 2018. Maggie Valley was originally part of the Cherokee nation. Scotch-Irish settlers then immigrated down the Appalachians and up from the Piedmont and established small farming communities. Churches were few and far between. The most effective Christian evangelists of this era were Methodist circuit riders, young men who rode horses to rural areas to preach the Word of God. In 1832, when settlers built the first road from Waynesville to Maggie Valley, Methodist circuit riders followed to preach to the new settlers and even further into the mountains and valleys. Two Methodist pastors even traveled with the Cherokee on their “Trail of Tears” journey to Oklahoma. In our valley, reading the Bible, praying, and singing happened every week among the small group of Methodist laypersons. Preaching and Holy Communion with traveling clergy were celebrated in the valley about once every three months. At its origin, the church was at the cultural center of Maggie Valley for all to worship and assist one another. The congregation during the mid and late 1800s included both “northern” and “southern” Methodists. Like many people in the mountains, the Civil War was a distant conflict foreign to their lives. On the same property, the growing congregation of 100 souls then improved their facilities in 1895 and 1900. Rough, exterior boards covered the outside. The first pews with backs were installed. The first church bell was purchased in 1900 for $40. The bell announced worship services, deaths, and called children to school. The bell could be heard from Soco Gap in the west to Dellwood in the east. The bell still hangs in the church and rings to start worship each Sunday. The sanctuary housed the valley’s only public school until 1910. Local Baptists worshiped in the same building from 1900 to about 1930, baptizing folks in the cold waters of Jonathan Creek behind the church. 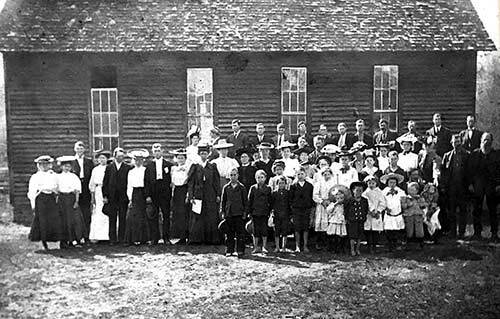 For most of its history, Maggie Valley was a mission congregation served by one pastor who also served up to a dozen other Methodist congregations. Frequently, the pastors then moved to other parishes. At least five young men from the congregation became Methodist pastors. renovated the sanctuary by adding river stones to the exterior. The exterior and interior shape are today essentially the same as over one hundred years ago. In 1980, 1990, and 2015 the church built modern additions behind the sanctuary that include classrooms, offices, fellowship hall, and large kitchen. By 2003, the congregation had grown large enough to be served by one resident pastor. Jonathan Creek still bisects the church property. The beautiful facility of stone and wood sits beside a large parking lot. And, if you look beyond the parking lot, there is a modern bridge across Jonathan Creek that accesses a church park that includes an old stone barn, a large field, and walking path. Many residents use the church park for meditation, relaxation, and dog walking. Serving the local community remains in the DNA of the congregation. Today the church hosts a food pantry each week. Shepherd’s Table, a Monday evening meal open to anyone at no cost, serves over a hundred people weekly. 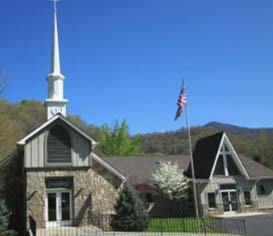 Today Maggie Valley UMC has about 350 members. Some members of the congregation are heirs of the founding members. Many other members, are new full-time and part-time residents. First-time guests visit every Sunday. Together we worship every Sunday and serve the community.